ACI's scope included installing a compressed air system on bridge conveyers extending 243' above the ground, and on a marine leg conveyer residing 198' above the Columbia River. Nearly five miles of pipe serving pneumatic gates, dust collection filters, and grain scales traveled along the outside "toe kick" walkway of the conveyers and atop the concrete silos. On an average day, our crews would walk 3/4 of a mileto climb a 30' stair tower to then begin a 1000' trek up a narrow bridge conveyer walkway. Safety of our workers, safety of the crews working below us, and a ZERO ACCIDENT installation was our key initiative. Morning Jobsite Safety Analysis (JSA) employee huddles reminded everyone of that day's specific safety concerns. Everyone working on the conveyers wore dual point attachment lanyards. All hand toold received lanywards which were attached to the employee's wrist. Every section of piping received two safety ropes to insure it would not fall to the ground during installation. Life jackets were worn while working above the river, and no one ever worked alone. Despite working outside during a thirty-one day stretch of dense fog, rain, sleet, and snow, these preventive safety measures resulted in a zero accident project! Despite all the hazards that existed on our EGT project, ACI Mechanical completed the project on time, on budget, and with zero accidents. 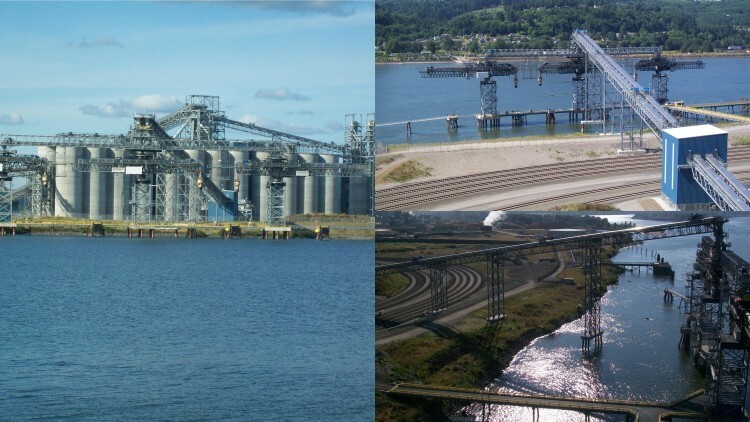 ACI is proud to note that Export Grain Terminal went on to become an award winning project for the team!